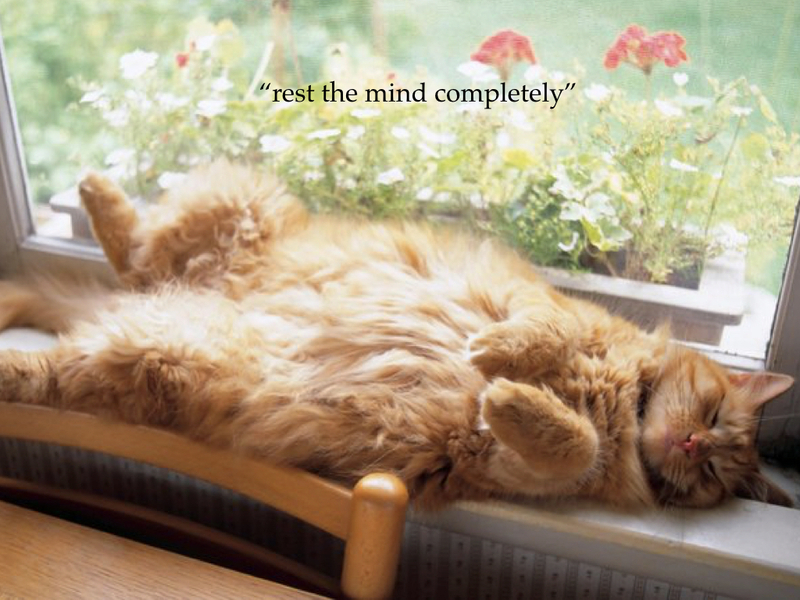 “… a mind completely at rest.” How do I do that? Can you see the issue here? Doing is a doing. The mind is an activity mechanism. And, someone is trying to figure this out which is another activity and doing. So, what’s a practitioner to do?! This conundrum is one of the great illuminations of vipashyana: the doer, the doing, and that which one thinks one should do. Add to these that the should is another whole set of thought-doings called ideals and aspirations or punitive directives, and that a should derives from emotions such as to be happy, to feel good, to be accepted, or in control. Vipashyana offers direct perception of these inner workings, of the psycho-spiritual being who is having them, and the contortions that we go through over even small things. This meditation does not focus on these illuminations. Phew! Yet, vipashyana is not bearing fruit if the meditator’s view and understanding remain unchanged, un-revealed. This meditation engages experience, including the heart as a mechanism of rest for the activity-prone mind.